A walk of 3.6 miles starting at the postbox on Woodgreen Common. The route passes through Densome Wood, continuing to Higher End Farm. 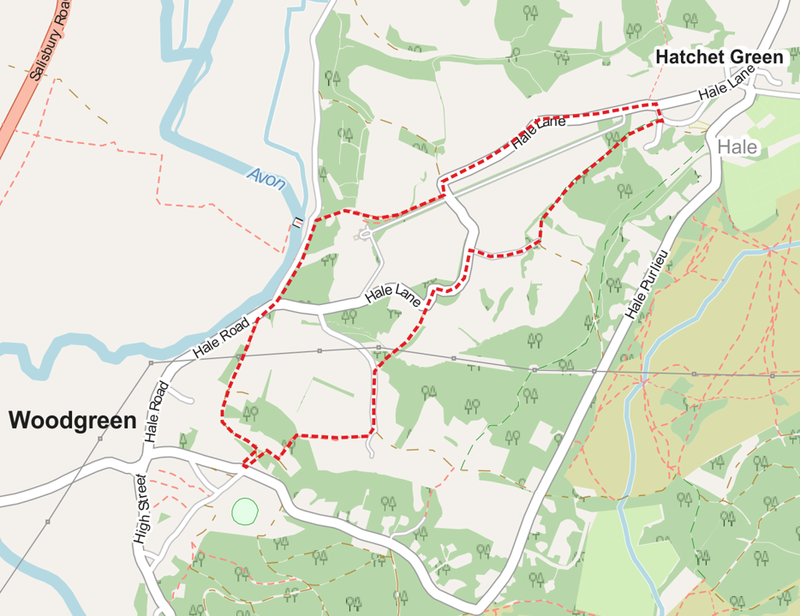 The route then crosses to Hale Road, passing the Picket Well and taking the back roads to Hatchett Green and returning past Hale House and Church. Hale House was built in 1715 by Thomas Archer, and he is most likely to have been responsible for laying out the surrounding formal gardens. From the entrance lodge, erected in 1923, a double avenue of four staggered rows of limes known as The Straight, runs to the front of the house. On the edge of the estate, on the right-hand side of Hale Lane going down towards Woodgreen there is a tall brick cone that caps ‘Picket Well’. It sits alongside and slightly below a pond in the Park itself from where water was taken to the stables. Path to Higher End Cross the field with the fence on your left. Go over the stile on the left into the next field. Tulip Tree Cross the field diagonally keeping the trees on your right side. The second is a Tulip Tree. At the far end, there’s a stile out onto the track. Bear left down the road. Ferny Homet Just past Ferny Homet, take the footpath to the right, descending through the wood, crossing a bridge, and then heading up a field alongside the stream. Picket Well Walk up the road to see Picket Well on the first corner. Continue along the road. Walled Garden Take the right turn into Queen Street just before the Walled Garden. Queen Street At the end of Queen Street, take the footpath on the left hand side opposite the large gates. Hale Farm Cross the field diagonally to a gate alongside a small barn on quorn stones. Continue through the yard and along the track. Hale Park Go through the gate and continue on the narrow path alongside Hale Park. Hatchet Green Continue on the track to Hatchet Green. Hale Lane Turn left, and left again, back down Hale Road towards Woodgreen. Hale House Take the footpath on the right through the white gate, alongside the main avenue to Hale House. Hale Church Continue on the path as it curves away to the right, away from Hale House, and descends through a wood to Hale Church. Moot Lane Continue down the path and turn left onto Moot Lane, opposite Cow Bridge. Hale Road Go straight on at the junction and after 20m bear left again up a track and crossing a stile back onto the Avon Valley Path.